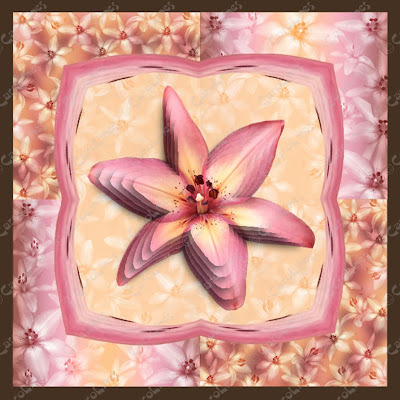 Sample card 6 made using the new Royal Sunset Lily Digital Kit. 1. Import papers P1 and P7. Re-size each to about a quarter of their original size. Make sure they are both the same size. 2. Position one next to the other. Copy, paste and position as illustrated and group. 3. Create a dark brown square, place it behind the patterned papers with a small border. Send to the task bar. 5. Re-size and place the paper behind the frame and group..
6. Bring the paper squares from the task bar. Re-size the frame and position in the centre of the card. 7. Import the lily, re-size and place it in the centre of the frame. 8. Apply the decoupage tool in the graphics programme...3 or 4 layers.